"The Magic Kingdom: a place of wonder where all things are possible and magic is real. Join this fairytale adventure and save the Magic Kingdom before time runs out, and the magic is gone forever." "The 49 Boxes is an episodic, story-driven experience where audience members play a role in solving mysteries that have been kept secret for more than half a century—all while interacting with artifacts from the Golden Age of Magic. This is not an experience that unfolds around you…it unfolds because of you. Entry into one of the world's most exclusive and private members only club [The Battery]. An exclusive, intimate performance of the most buzzed about immersive storytelling puzzle experience: 49 Boxes—"The Magic of Thayer." 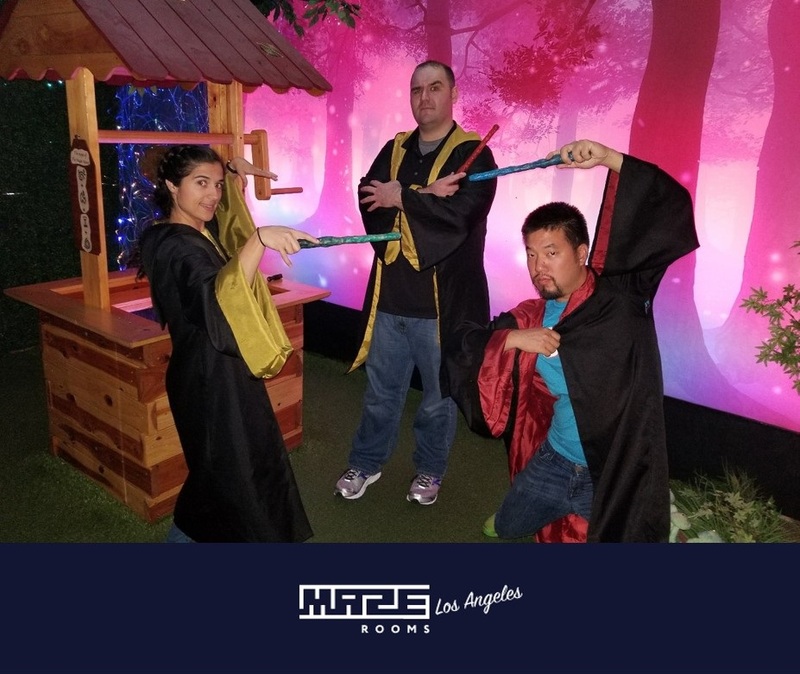 Reviewing this event was not a simple task as the designers do not see this as an escape room (more as immersive storytelling) but from an enthusiast's perspective, the format and experience is on par with any large format escape rooms games that a company like SCRAP commonly holds. There are 10+ tables with 8 people per table all solving puzzles with an overarching storyline. Escape Room in a box! 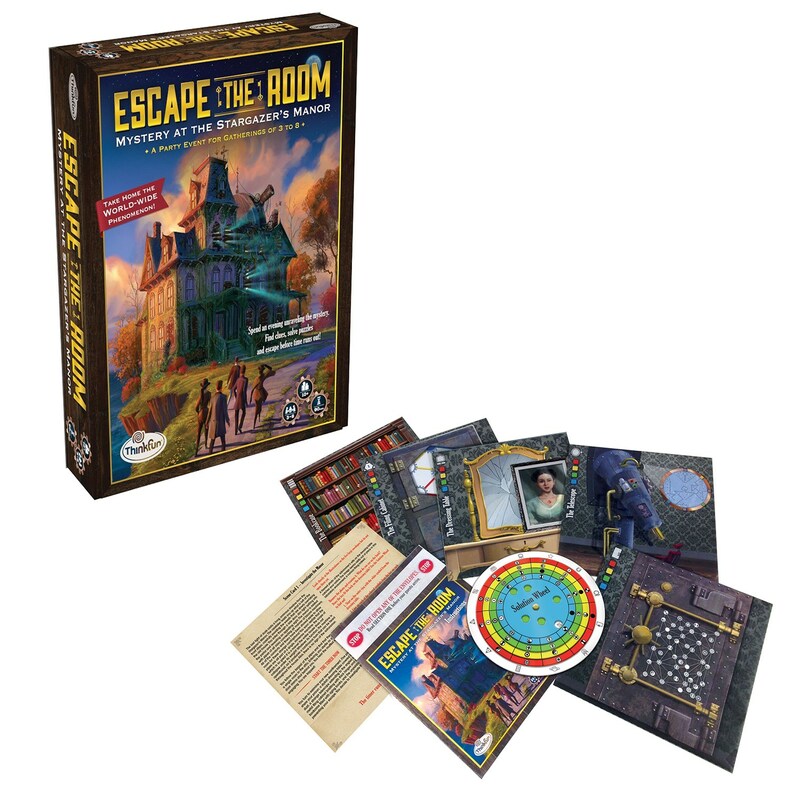 This is our first review of an escape room board game! Not only are we escape room enthusiasts, we are pretty well versed in European style boards games which are basically games that rely on strategy and problem solving rather than just luck and dice rolls (I'm looking at you Monopoly). Board games that we love include Dominion, Agricola, Battlestar Galactica and Deception in Hong Kong. 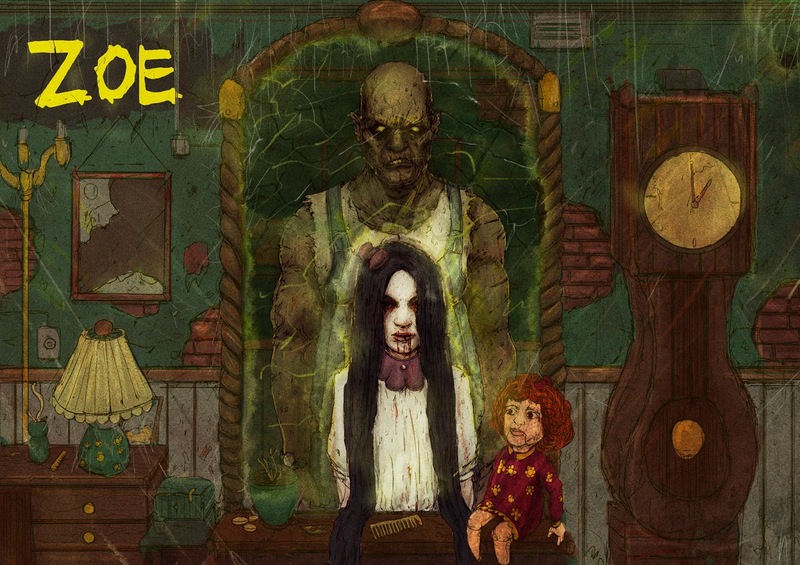 "Spend an evening working with your guests to solve puzzles, unlock hidden clues, and unravel the mystery of the Stargazer’s Manor. Will you and your guests be able to solve the mystery and save the astronomer before time runs out? The Mystery: It’s 1869 and the town’s well-respected astronomer has not been seen since the untimely passing of his wife. Recently, strange things have been happening at his manor – loud and unfamiliar noises, an unpleasant smell, and smoke billowing from the observatory. It’s up to you and your guests to solve the mystery at the Stargazer’s Manor!" "There is one scene in your mind that is busily following you. It has initially appeared in your dreams, the scene of an abandoned house, but it has started chasing you during the daytime. This house seems to be calling for you, it attracts you with an unknown force...What’s wrong with it? Is there anyone living there?Does he or she need help? You cannot survive it any longer, it’s driving you crazy...You start surfing and accidently [sic] you find the needed location…You reach the place. You open the door and...become trapped. You have only one hour to escape until your personality starts to change." Written by Matt Neal: Southern California has a few things going for it that produce some amazing rooms. A huge population and endless stream of tourists keep the customers coming. The film, theme park, and haunt industries provide an amazing talent pool to pull from and inspiration to dive into. 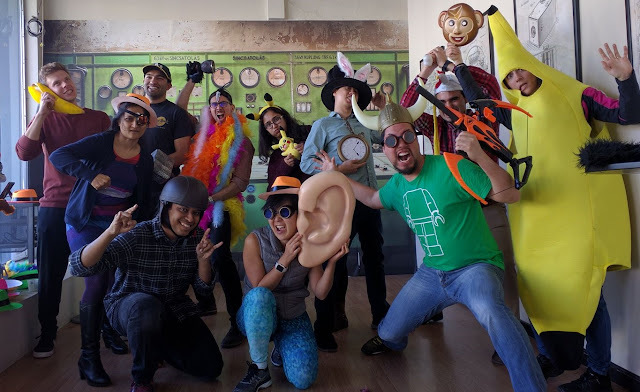 Well established escape room brands keep delivering amazing new experiences, driving competition higher and higher. "One morning as the Ancient Nile Breaking news was broadcasting a story about the Kings lost tomb, it was found by a couple of archaeologists! Upon the discovery the Tomb opens and the King awakens, raged, and is trying to escape his tomb to bring darkness onto all of Egypt as he wants to avenge his death. The only way to shut the tombs door is from the inside. You and your fellow archaeologists did so and now you were stuck inside the tomb and need to find a way out. As you were wandering around, you step on a trap which triggers a countdown of 60 minutes for you to find the kings tomb and escape before you are trapped in the chamber for all of eternity. Will you make it out?" Make it out we did and we were amazed at the gold we found inside. "You’ve been called in to help an infamous but now kidnapped detective and his assistant, a Mr. Watson, has asked for your assistance in recovering a missing artifact and using it to barter a deal to release the hostage. It might feel elementary but you will only have 60 minutes to discover all the hidden clues in Mr. Holmes’ library and help him escape, for if you fail, you will both be trapped forever!" "An Hour To Kill: Come and be a part of James Bond's last adventure. James is on his last mission before retirement when he went missing. You, England's best agents must figure out a way to get through all the security systems in Military Intelligence (MI-6) and the vaunted training facilities and danger room. Your mission, should you choose to accept it agents, is to find out what happened to Bond on his final mission? The School or Sorcery: It's your first year as a wizard. You have 1 hour to finish magical exams to prove your abilities. Conjure up spells, and make potions with your classmates. Be careful, there is dark magic in our castle. Lab 51: As part of an elite military strike force, you must infiltrate Lab 51 and find out what happened to the mysterious alien life form that is kept there. The lab is set to self-destruct in 1 hour. The clock is ticking, soldier." "Try to escape lunar station in disrepair and survive. Far in the outer space. Only team work can return lunar crew home."